Years ago when my son and I were getting interested in scuba diving we came across list after list of the best dives in the world, the ones you don't want to miss. One dive in particular was consistently on the top of just about every list, so we researched more, watched videos, and dreamed of getting the chance to do it. Our interest was revived in the dive again when we got our scuba certification, and yet again when we got settled in Hawaii. Yup, we actually had the opportunity to do this once in a lifetime dive. We were both a little nervous but super excited. Neptune Charlies dive center offered to host us for the dive and we were thrilled to take them up on it! Now I am not going to lie, I was super nervous, we both were really. The thought of entering the ocean in the dark scared me to death, add in my anxiety about diving in general, and the fact that these mantas are well over 15 feet across and yeah my nerves were rattled. Mantas, by the way, are large but completely harmless. They have no teeth or stingers and only feed on plankton that are drawn in by the boat lights. We pushed through our nerves though and headed out the door to the marina (time and harbor for departure vary by season so inquitre for those specifics when you book). We located and boarded the boat and were introduced to the captain and dive masters, signed some forms, stored our belongings in a water tight case and were off. As we sped out the 20 minutes to get to the dive site we were given general briefings about the boat and what to expect. To our delight we were interrupted and called to the bow of the boat as 3 spinner dolphins were bow riding and delightfully leaping out of the water. It was certainly an added bonus. I got the feeling that it happens quite often and that alone started to ease my worries. It was explained to us that the water was a little rough and that the final determination would be made once we arrived. Now this was good and bad news. The good was that many of the boats had canceled their trip so we were lucky to only have 2 other boats in the water. The bad news was that it was actually pretty rough, not helping my nerves at all! The dive spot was only about 50 feet offshore and when we arrived the waves were crashing. I was worried it may be canceled but they decided to go for it so the briefings began. On board there were only 2 other divers besides us and the dive master. They went through a detailed account of what was going to happen and really explained well the situation with the tides, the mantas themselves, and exactly where he would be while we were there. We were relieved and felt a bit more relaxed knowing the details. After that the snorkelers got in the water. They have platforms to hold onto and it appeared that they also received a thorough briefing as to what to expect but we were diving so I was not privy to all of the snorkeling information. All our gear was set up and ready to get into. A nice change from lugging our own gear around while scuba diving in Malaysia. We suited up and as the sun was nearly set we hopped off the back of the boat into the clear blue, well dark blue I guess, Pacific ocean. I jumped in and was ready to start deflating my BCD. Admittedly my anxiety was through the roof. I thought it would be due to the dark water or maybe even due to the sheer size of the manta rays that were already circling around us but that was not the case. I have not dove in quite a while and for some reason just could not get my breath regulated at all. The dive master was incredible, trying to help me gain a comfort level. He stayed right in my face the entire time. 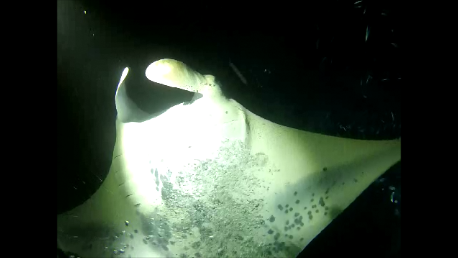 At one point I was so distracted by the giant ray floating right next to us that I could not focus at all. But at the end of trying for 15 minutes, and not wanting to hold up the group I decided to return to the boat. The dive master helped and made sure that I got back safely before heading off with the other divers. I teared up as I removed my gear, just terribly frustrated at myself. But there was nothing to do about it at that point. 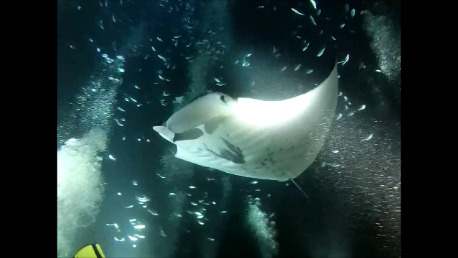 I did get to see mantas and most important my son, the real diver in the family, got to have the full experience. Dylan jumped in and after a moment of anxiety he relaxed, purged his regulator (this helps to make you feel like you are getting a deeper breathe), and was able to relax enough to breathe properly. He tried to help me relax and I could see the sadness in his eyes that I would not be joining him, but off he went. I handed him the Go Pro and swam back. He however, dove down at this point. Now I am not sure if this is typical but our time in the water was rough, the current even below the water was quite strong so, as was explained during the briefing, the dive master swam them over to the lights (a large set of permanent drums that sent huge torch light into the water to attract the plankton) then brought them over to the spot he felt was safest to sit and watch the show. He also brought a large rock over to each person to be placed in their lap, this was to prevent any major movement due to the strong current. For the next 30 minutes he sat and watched in amazement as the mantas rolled, glided, and soared through the sea as if they were birds. Words cannot thoroughly describe it so watch this video below for the basic idea. There were 6 in all coming and going at various times. The dive master was with the divers the entire time. You could tell how excited he was about diving and mantas in general through the whole trip! He brought over fish so they could see, pointed out different things he saw and made a point of checking on each person to see if they were OK and to check their air. Safety seemed to be of paramount importance! Once the dive was over they swam back together to the boat. Dylan immediately had a sad face and came over to give me a hug. He knew without even asking how disappointed in myself I would be. The dive master also came right over to see how I was and to assure me that it happens. He was super supportive. It was a really nice gesture and he even offered to take me out one day one on one so I could have more time to acclimate. All in all it was a great experience. I wish the water was calmer and that I would have been able to push past my fears but it was still a great outing and one we'll never forget. For my son, who did the full dive, it provided that last bit of assurance that this was, in fact, what he wants to do as a career. I am so thrilled that he had this experience at such a young age! The boat was large and comfortable. There are buckets provided to keep your things dry and I suggest you bring something warm to wear after as it really is not as warm in Hawaii as many assume, especially in the evening when you are wet. Snacks, ice water, and hot chocolate are also provided which is a nice touch. I suggest that you take some type of sea sickness medicine if you are prone to motion sickness at all. Many people were turning green by the end of the night and that is no fun at all. Additional items to bring are your towels, diver certification card, and dive gear if you have your own. If not you can rent full gear from Neptune Charlies for a small fee. So have you done the best dive in the world? Would you? Oh, I have gooisebumps just reading this. I have done a few dives in Kona and this was one of them. 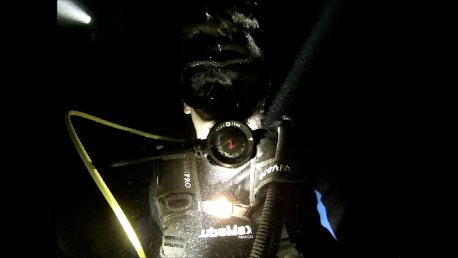 I also loved diving through the lava tubes and happening upon a nurse shark in the tube. I just love diving. It is all so magical and peaceful. I absolutely love this post. I do love it too but I think I need to go more often or my anxiety gets the better of me. Not sure why I could not regulate my breathing. 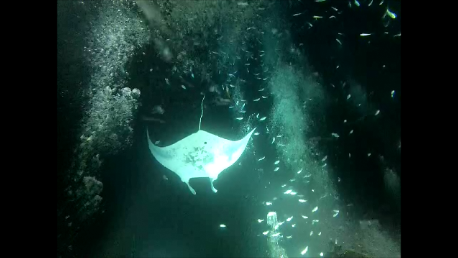 Bummed I missed it but glad I got in and got to see some mantas down there anyway:) Most glad my son had the chance! I don't dive. but my adventurer husband who flies a plane and skis also dives. I took him to my home country, the Philippines. We have such good diving spots there! You are so lucky you have the guts to do all these fun things! Oh I would love to dive in the Phillipines! Lots of great spots and far less expensive than here in Hawaii! Its funny, it was not as scary as I thought it would be. In hindsight I should have tried clearing my regulator or maybe it was just the cold. I felt sad but can't be mad at myself too much:) It was a lovely evening no matter what and my son had a blast! Ohh fun, I'd love to do shark diving! 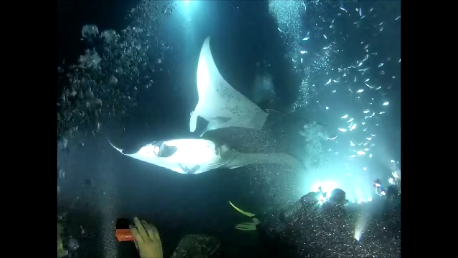 Dive at night time and with manta rays must be absolutely amazing! Dreaming to get your Padi certification this year so we can start our under water adventures too.